. 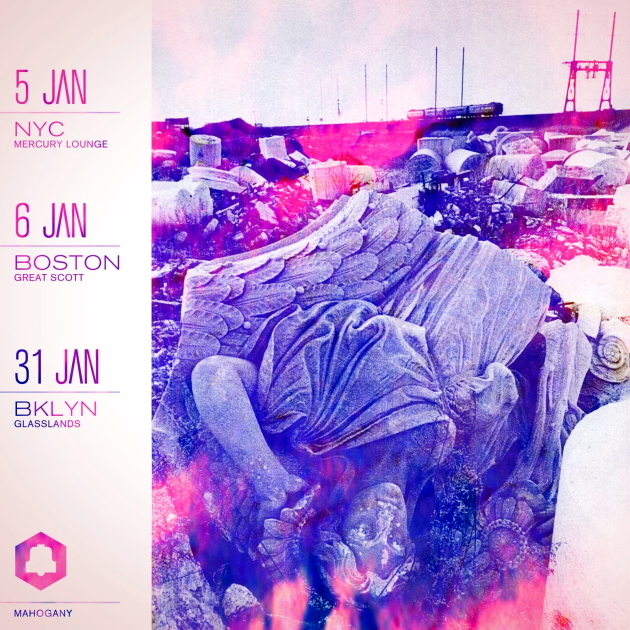 : Mahogany with Autodrone | Great Scott, Boston | 6 Jan.
Mahogany with Autodrone | Great Scott, Boston | 6 Jan. It's shocking to us, now that we look and think about it, but shoegaze futurists and railway obsessives Mahogany last released a full-length collection some seven years ago, back when there were things called Friendster and Virb and newspapers (almost equally shocking was the revelation from the Clicky Clicky archives that The Big Sleep's/former Haywood guitarist Danny Barria also logged time with Mahogany). We reviewed Connectivity! here way back when, and between then and now there's been a fair amount of nothing. The 2006 set is immaculate, and touts icy, space-aged beauties such as the entrancing instrumental "Windmill International A" and the oddly Belle And Sebastian-esque "Neo Plastic Boogie-Woogie" [video]. Over the years the former octet has reduced to a duo comprised by Andrew Prinz and Jaclyn Slimm. It hasn't been total silence in the interim, however: the pair's most recent release was the Homeric single "Phase Break," which our own Edward Charlton wrote about here in May. Might 2014 be the year we finally get a new long-playing album from Mahogany? This BrooklynVegan piece from October indicates the answer to that question is a resounding, well, maybe. Either way, Monday's show is a rare chance to catch the brilliant act live, so plan accordingly -- tickets are available right here (New Yorkers can catch the band at Mercury Lounge Sunday night). And while you're doing so, listen again to the marvel that is "Phase Break" via the embed below.